Quality commercial enterance mats to protect your floors. Heavy gauge clear plastic carpet runner has grippers on the bottom of the runner keep it in place. Herringbone pattern creates nonslip surface. Protect your hard surface floors with this vinyl runner. Available in 36" and 48" widths. 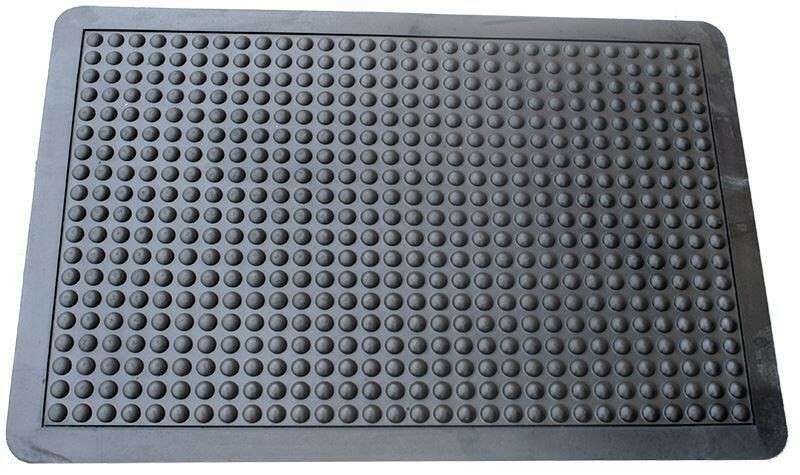 The Anti Fatigue Bubble Mat allows air to flow under shoes for added comfort. Designed for anti-fatigue, this bubble mat combines safety and comfort in one. This Cocoa Entrance Mat is perfect for heavy traffic areas. Grand-Stand Deluxe marble colored industrial mats have 3/32" thick rubber permanently bonded to a natural foam base, which provides excellent anti fatigue capabilities. Try this Grand Stand Deluxe Fatigue Mat for your mat needs at home or at work. Foam provides legs and feet from fatiguing throughout the day. Recommended for indoor use. Absorbs moisture and picks up debris from shoes to protect your floors and home. Grooved construction will easily pull water and dirt away from shoes. A good entrance mat is your first line of defense against damage to your floors. Unique pattern on this commercial entrance mat catches dirt from all directions. Heavy duty construction aids in Ridgeway's durability. Durable Corporation Fingertip entrance mat will improve safety and cleanliness in your workspace or at home. Beveled edges provide foot and chair traffic to move easily on mat. Niagra heavy duty commercial entrance mat is an effective product for trapping and holding an enormous amount of dirt and water! Protect your floors. This unique mat is made of 80% post consumer material, made in the USA, and will not move or bunch.